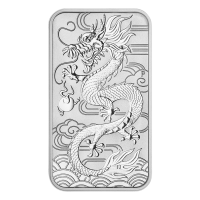 1 oz 2018 Perth Mint Dragon Silver Rectangular Coin | ?? 正面 Ian Rank Broadley's effigy of Queen Elizabeth II as well as the year, and denomination. 反面 Chinese style dragon chasing a flaming pearl with a wind and cloud background.